The death of a pet can herald a challenging time when you’re trying to anticipate everyone’s needs and emotions. As well as your own grief, your children may need support or you could have a partner who shares your overwhelming sense of loss. For many people, another consideration is the well-being of a grieving pet. How can you help them? Is there anything, in particular, they need from you? Is their grief impacting on their health in some way? These are all common concerns. Although not always the case, many pets, regardless of species, develop a very close bond with each other, sometimes over many years; they may have eaten, slept and played together their entire lives. 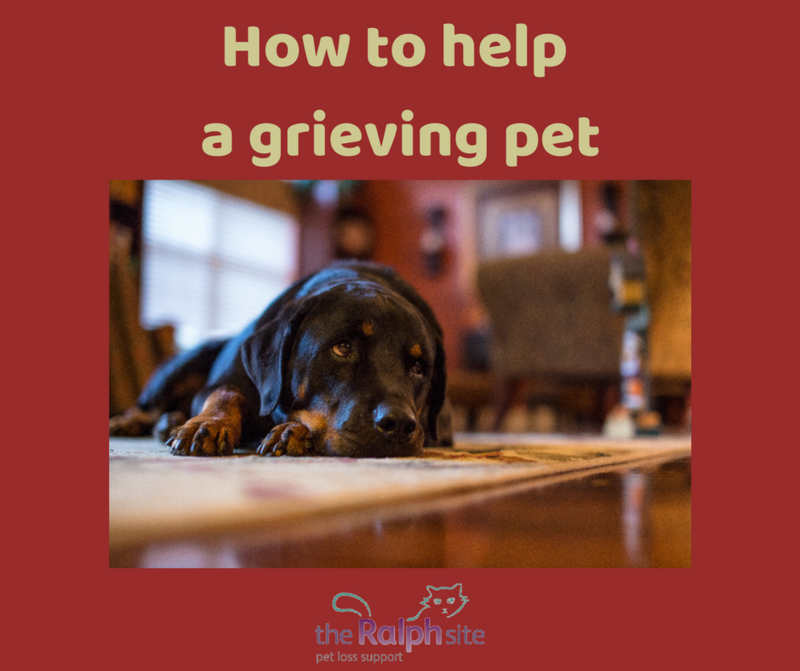 It is important to remember that other pets may suffer bereavement and grief just as we do when we lose a companion, and just like us they may display this grief to varying degrees. Animals express grief in different ways and it seems to have a varying impact, depending on the species and individual nature of the pet. If you have a surviving pet who’s showing any of the above changes in behaviour, they may well share your grief for their lost companion. When an animal has lost a companion, it’s important to monitor their health and behaviour closely. Given time, many animals – like humans – find a new rhythm to life and begin to move forward. However, there are some cases where changes in behaviour due to bereavement should be taken very seriously. One example is with herd animals like guinea pigs. These vocal but gentle little creatures tend to thrive in company, showing social behaviour in pairs or small groups that you may not see when they live alone. Guinea pigs tend to form a close bond with their companions and may become depressed, disinterested in life and lose their appetites when a cage mate passes away. Because they have such fast metabolisms, just a short space of time without eating can have catastrophic consequences for the remaining guinea pig. If you do notice that a bereaved guinea pig has stopped eating, you may need to see your vet straight away for advice or liquid food that can be syringe-fed. Of course, you should always consult your vet immediately if your departed pet died of a contagious illness that could affect his or her surviving companions. Although you may feel like you need some downtime following the loss of a pet, it’s important to try to stick to your usual daily routines as much as possible. With so much having suddenly changed in their life, your surviving pet will benefit from the predictability of keeping to their normal routine. You may even find that it helps you too. Even if your pet has lost their appetite, try to stick to their usual mealtimes to remind them to eat and to ensure food is available. If your pet is still refusing to eat after a few days, you should seek veterinary advice. It can be heart-breaking to watch a bereaved dog cry at the door or window for their lost friend but you should think twice before rushing into comfort them as you may inadvertently reinforce the behaviour. Instead, try to offer comfort to your dog when they’re quiet and laying down or cuddling up with you. Your surviving pet(s) may need reminding about the good things in life. Positive activities such as walks, games and puzzles, and training activities with plenty of treats may help. Lots of cuddles and interaction will help bereaved cats, dogs, rabbits, guinea pigs, rats and other small animals feel like they still have companionship. You may even want to give them a soft toy to cuddle up to for comfort. If you live in a multi-pet household, the death of one animal can impact on the whole hierarchy/social structure of your surviving pets. You may find that there are some skirmishes and disagreements as your animals regroup and figure out where they now sit in the social order of their group. Unless there’s a risk of one of them getting hurt, it’s usually fine to step back and let them sort it out amongst themselves. If you are struggling with your own feelings of grief, you may feel like you want to close yourself off from future hurt. Many pet carers see their surviving pets in a different light – that one day they will feel the same agony over losing them – and this can make people want to withdraw. However, pets can sense this change in your mood. If you seem sad all the time, they may want to comfort you and become clingy, wanting the reassurance that everything will be okay. They may also misbehave as an expression of their anxiety and double loss (their friend and now you). It can be incredibly hard but it’s important to be open to your surviving pet’s love and affection. It will help you as well as them - animals have a rare gift of making the world better just by existing. Just as you need time to mourn your loss, your surviving pet may need time too. Anecdotal evidence suggests that animals such as dogs and cats remember and miss their past friends for some time. As helpless as it may make you feel, all you can do is provide a loving and secure environment in which to grieve. It’s tempting to view your surviving pet through the lens of grief, seeing sadness in every pose and facial expression. However, in some cases, pets aren’t strongly affected by grief or experience their grief but gently move through it. It’s important not to project your own feelings and not to be hurt if your pet doesn’t appear as devastated as you thought they would. If your deceased pet died in sudden or traumatic circumstances, you may feel protective of your surviving pets, wanting to shield them from harm against all costs. While this is completely understandable, it’s important to think about their quality of life and mental wellbeing. For example, is it reasonable to always keep your surviving dog on their lead in the park because your other dog ran out in front of a car outside your house? Should you let your surviving pet(s) see their deceased companion? This question is obviously more or less applicable depending on where euthanasia is performed and the practical implications of allowing your remaining pets to see their deceased companion. Although it isn’t always possible for surviving pets to spend some time with their deceased companion, many people feel it is advisable in some cases if circumstances allow it. It is generally accepted that dogs and probably cats and other friends like rabbits and guinea pigs do benefit from being able to see and smell the body of the deceased pet; by recognising the other animal to be dead it provides an explanation for the sudden disappearance. Allowing surviving pets to see the deceased one can help to minimise the severity and duration of their grief; even if it doesn’t, it is unlikely to worsen the situation. With rabbits, for example, many experienced carers feel that a rabbit should be given between three and six hours alone with the body of their companion. At first, the surviving rabbit may try to rouse its fallen friend but, as the hours' pass, people often notice a shift in the surviving rabbit’s demeanour as they realise their companion isn’t truly present. Guinea pigs benefit from seeing their deceased cage mates too. They may push, lick and even gently nip at a friend that has died but only in an attempt to wake them. With time, they begin to realise that their companion isn’t moving and seem to feel less distressed when the body is removed from their habitat. People with several dogs often like to give the remaining canines the opportunity to see their deceased companion, feeling that it’s helpful. Other dogs take comfort from being able to sniff their lost friend’s bed or favourite blanket. One thing to be careful about is that if you are burying your departed friend's body in the garden, it is probably best not to let a dog see where as this may lead to him/her trying to dig the body up.